Australia, Australia, we love your political theatre, Australia, amen. iPredict was a bit overloaded during the surprise Labor leadership vote Thursday – it probably saved me from losing money. But it’s fun to see what the markets thought of the whole mess. Recall that Simon Crean put himself up yesterday for Deputy Labor leader, expecting that Rudd would declare his candidacy for the leadership. Gillard announced there would be a leadership vote to be held at 4:30 Oz time, 6:30 PM NZ time. This came as a surprise, or at least my Twitter feed was filled with very surprised Australians all tweeting at #spill and #spillage. Note that this was to be, I believe, the third time that Rudd has tried ousting Gillard. Labor’s odds have been in the toilet for, well, ages. At iPredict, contracts paying $1 if Labor were to win were trading in the $0.15 – $0.22 range; for the couple days prior, they sat at 15%. Gillard’s odds of surviving to be Labor leader on nomination declaration day were around 70% prior to the vote’s being called – they’d eroded by about ten points over the prior fortnight. When the markets saw there was to be a leadership vote, Labor’s odds jumped as high as 30% while Gillard’s odds of surviving to nomination day dropped below 10%. 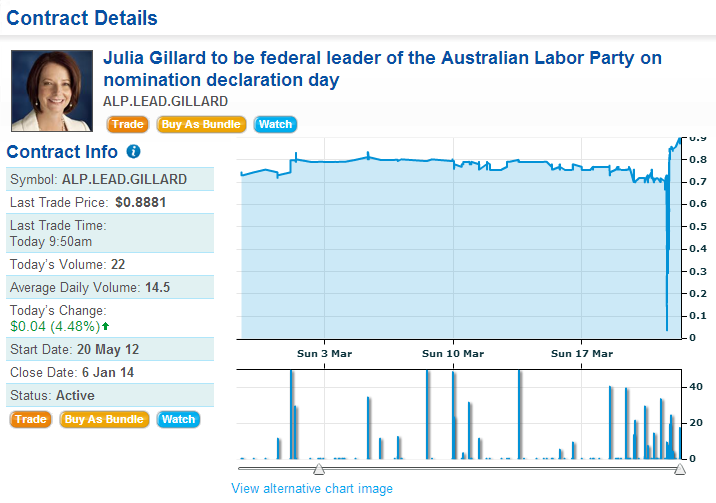 Labor’s odds stabilised around $0.17 afterwards, with Gillard now 88% likely to lead Labor into the next election. 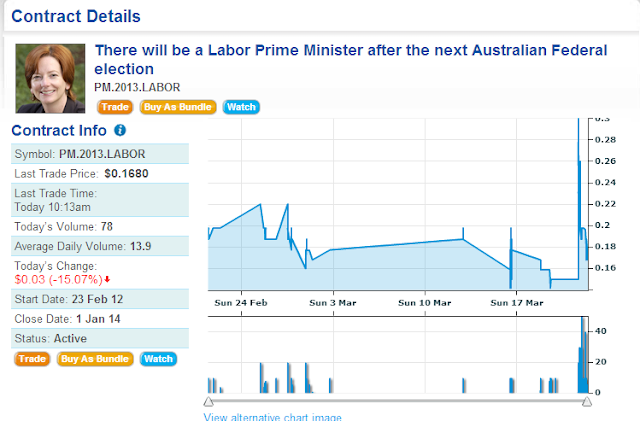 When the markets thought Rudd would be coming back, Labor’s odds of winning went up. 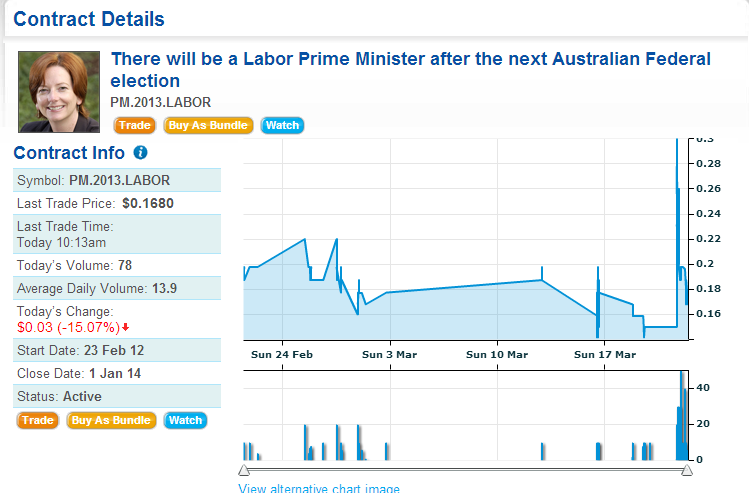 After #spill failed, Labour’s odds went back down. I wouldn’t necessarily interpret this as the markets saying that Gillard should have been turfed; you might want to keep a less popular leader through an election you’re likely to lose to keep your options more open after the election. Me? I’m hoping that, after a year of a very large majority Coalition government, Andrew Leigh becomes Labor leader. He then loses the next election but not by a lot. Instead, he gets a lot of new Labor talent in who gain experience. Then he wins the subsequent election. I don’t think I’d pay more than $0.05 for that contract, but I can hope. [Note: the iPredict markets above are still pretty thin; BetFair’s dynamics were similar but don’t have date-stamped charts].